AlfaNova fusion-bonded plate heat exchangers are made of 100% stainless steel gasket free construction. 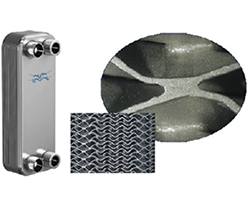 AlfaNova fusion-bonded plate heat exchangers are made of 100% stainless steel. They are suited in applications which put high demand on cleanliness, applications where aggressive medias like ammonia are used or where copper and nickel contamination is not accepted. AlfaNova heat exchangers are used in applications such as: HVAC heating/cooling, refrigeration, process heating/cooling and oil cooling. The AlfaNova line has an extreme pressure fatigue resistance and covers high temperatures (up to 550°C).